Chord Tone Introduction * - Eat. Sleep. Guitar. CHORD TONES = the individual notes that make up a chord. Standard major and minor chords are called triads because they only contain 3 notes. The major triad is denoted as just a capital letter like C. The minor triad is usually capital or lowercase and contains a lowercase “m” like Cm. Lets take a look at the original 5 pentatonic scale shapes with the (triad) chord tones added to the charts. 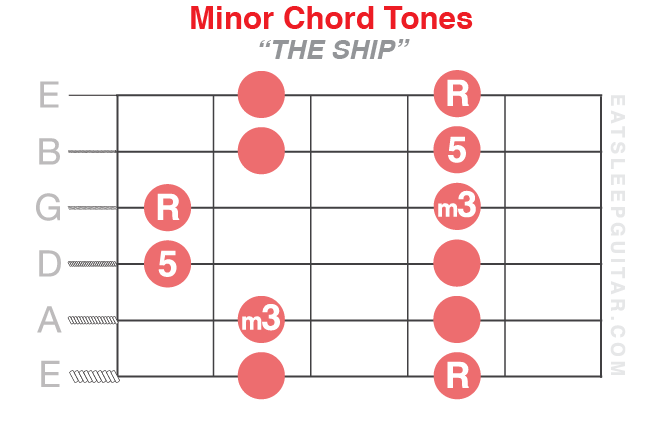 Understand that both major and minor chord tones exist within each shape and learning how to emphasize these tones will let you bring out the major or minor quality of the scale notes. This is a super important skill for both lead and rhythm playing. How should you analyze these? Click here for the next section.